In 2015, illustrator Goro Fujita and I were responsible for an alien invasion. Your Alien begins when a little alien crash-lands on a boy’s front yard. The two have a great day together, but, when nighttime arrives, the boy notices something is wrong with his alien. At last, the boy figures out exactly what his alien needs. Your Alien has been well-received by lots of important earthlings. It earned stars from PW and Kirkus and was one of NPR’s Best Books of 2015. This alien is also invading Spain, Italy, France, and South Korea. I have some good news! He’s baaaa-aaaaack. 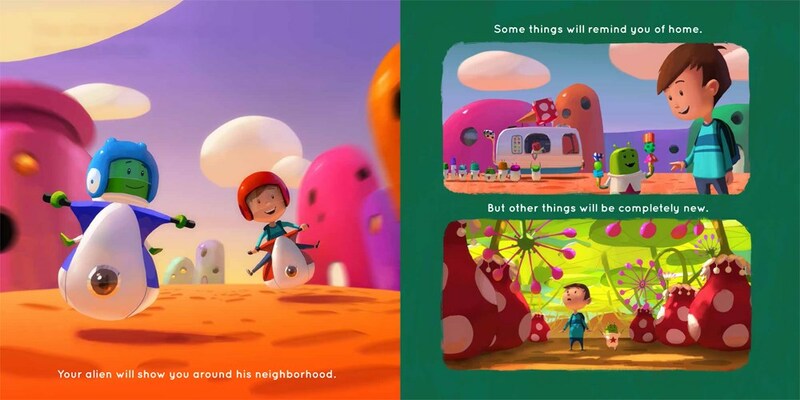 In Your Alien Returns, the alien invites the boy over for a play date on his planet. While on this play date, the boy and alien have a wonderful day together…until one moment changes everything. In Your Alien, the boy figures out how to save the day. In Your Alien Returns, the alien returns the favor. This leads me to my big tip for writers: One of our key responsibilities is to make readers FEEL something. Writers should not just write words, words, words and hope for good. Those words need to create some sort of an emotional connection. Oh, and while I can’t guarantee that an alien will crash-land on your front lawn, I can give you something fun to do while you wait. 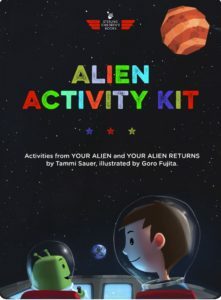 Sterling, my publisher, created an Alien Activity Kit. It’s out of this world! To celebrate the release of Your Alien Returns, I’m giving away a signed copy of this book, a bookmark, and YOUR VERY OWN ALIEN to one lucky earthling. Leave a comment to enter. The winner will be revealed in my next post. 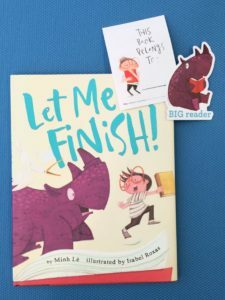 Congratulations to Jen at https://picturebooks4learning.wordpress.com/, winner of the Let Me Finish! prize pack. Many thanks to Minh Lê! Goro Fujita, Tammi Sauer. Bookmark. Love this duo :-). Congratulations, Tammi!! Love that this friendship gets a second book! And thank you for the generous giveaway! Can’t wait to read this! My Alien is one of my favorites. I can’t to see what they get themselves up to next! We still love the original book. Can’t wait to read the new adventure. Thanks for stopping by Picture Book Builders, Katie! The original was so great. I can’t wait to read this one! Spare text yet tells such a rich story. I’m excited to read the next installment about these friends. Great illustrations along with an engaging story. Thanks for the character development tip! Cant wait for some alien fun. Oh!Oh! Can’t wait to read about these friends again! Thanks for the writing tip! Adorable! Congrats! I enjoyed Your Alien so can’ wait to read the sequel. What a cliffhanger! I can’t wait to see how the little green cutie saves the day. 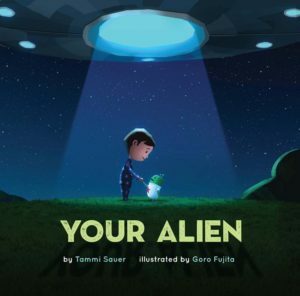 Congratulations Tammi and Goro on another great picture book! I love the way the writing and the illustration fit together. Thanks for the “feeling” comment, Tammi. This post makes me want a little green munchkin myself! Super exciting. Can’t wait to read it. Love everything you write! Looks like a perfect sequel! So excited to read the second adventure with these two friends! 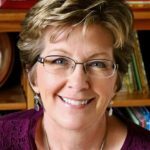 Thanks for the writing tips, too! Too cute!! I can’t wait to read it! Oh, I love the first alien book, so can’t wait for part 2!!! Your books are filled with fun and heart. 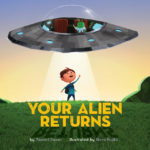 Your Alien is a household favorite and we can’t wait to add Your Alien Returns to our collection! I can’t wait to read the newest alien story! Yay! So excited for the next alien and boy friendship adventure. Can’t wait to read it. And your comment about making readers FEEL is spot on. I’m looking forward to reading this one! Congratulations! Can’t wait to read this! Adored the first installment. Beam me up–I’m reporting for another adventure! (I’ve always wanted my very own alien.) I just adored the first book, Tammi. So looking forward to reading the next adventure! Tammi, I’m so excited to read YOUR ALIEN RETURNS! I love the first book. Congratulations! Exited to.see this sequel. Congrats Tammi. Kids of all ages love aliens! Especially this big kid! 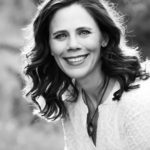 Thanks, Tammi, for being such an inspiration. Thanks for your kind words, Kathy! What an out-of-this-world adventure. Can’t wait for it to begin. Congratulations, so glad they’re back! Can’t wait to read this! The kids love Your Alien at our library – can’t wait to get the sequel! I loved the first installment, and I’m looking forward to reading the sequel. Congratulations! I wish I could be that earthling! I loved Your Alien :). Congrats, Tammi :)! Congrats, Tammi! We love YOUR ALIEN. This companion story sounds adorable! The first one was such a hit with my grandson. Got it out of the library when he was 18 mos old — would seem too young for the story, but he loved it. Now at 2 1/2 he has his own copy and still loves it. So exciting to hear there’s a companion title coming! I’m a huge Tammi fan. What a great way to follow YOUR ALIEN, Tammi. I look forward to reading it. This looks like an adorable book! I love all the books you send us. Thank you! Thanks for stopping by Picture Book Builders, Jen! So exciting that there is a sequel! I can’t wait to read this continued story of an unusual friendship. It is so important to plant these seeds in our little people since we live in such a diversified world. And Tammi makes them fun! Our students love My Alien and are very excited for the sequel. Can’t wait to have you back to Heartland in the near future! I just can’t wait to read this one Tammi. Love that alien! I printed off the activity kit for my son and he had a lot of fun working on it – thanks for sharing! What a fun idea to flip it so now we get to see the alien world! Love it! Off to the library I go! Thanks. The sequel looks so fun! Love how the book is so bright and inviting. Awesome! So happy the duo is back. Congratulations on the sequel, Tammi. Love that the destination is reversed. And thank you for the writers’ tip, too. Congratulations, Tammi! Thanks for your writing tip….so important! Looking forward to reading the sequel! 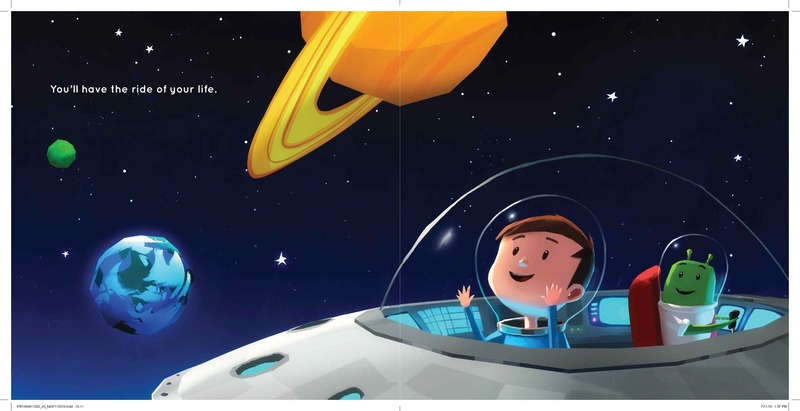 Cute little alien befriends a boy…can’t wait to read about their play date adventures in the next book! My kids LOVE the first book! They will be so excited to read the sequel. And thank you for the great writing tip! Congratulations, Tammi! The book looks so fun and adorable, the art pairing perfect, and I loved your tip for writing emotional stories. Thanks so much! Congratulations, Tammi! We are so happy to hear the cutest alien is coming back to earth! My son will be super happy to find it out! Ever since we made the green alien figure with the green play dough, our alien is sitting on our dining table and have been eating with us! 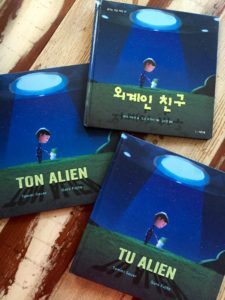 We LOVE your adorable Alien book!! !